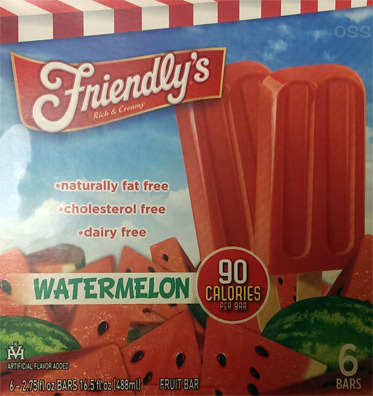 [New for 2014] Along with deluge of chocolate covered treats that they've added to the freezer aisle, Friendly's also added a fruit (ice) bar to their treat mix this year. Rather than go with a typical flavor like strawberry or some citrus flavor, they went a bit obscure. Looks like every other fruit bar out there, and has that similar, somewhat icy, consistency. The flavor is.... not that bad actually. I did fear an artificial blast of bleck but instead the flavor is very mild. You know, the kind of flavor where you tell yourself it's watermelon so you don't forget what you are eating. I would like it to be a bit stronger and sweeter, but I guess I prefer this to any kind of overly fake flavor they could have thrown at us.